From Kasie Hunt, Leigh Ann Caldwell and Alex Moe: "House Republicans are pressing ahead with the announcement of their sweeping rewrite of the tax code Thursday morning. But with just hours to go, there are major questions still in limbo and disagreements within the Republican conference as lawmakers grapple with the president's latest demand: Whether to repeal the Obamacare mandate to buy insurance as part of tax reform." More, from the Washington Post: "House Ways and Means Committee Chairman Kevin Brady (R-Tex.) said Wednesday that the bill he will introduce would not permanently lower the corporate tax rate to 20 percent. Instead, the cut would be temporary, and that reduction would expire in around eight years, according to a person briefed on the planning who wasn’t authorized to disclose details. Brady said he had to make changes to keep his upcoming bill in line with rules Republicans need to abide by if they hope to pass the measure through the Senate without Democratic support. 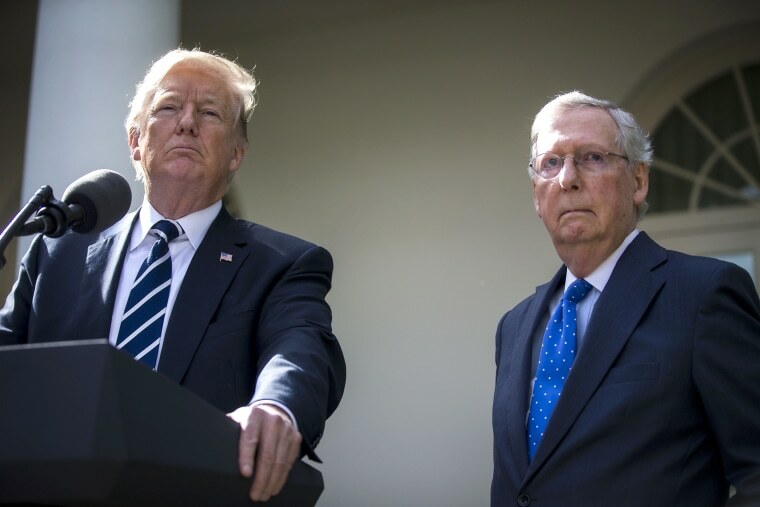 He added he hopes to make changes during negotiations with the Senate at some point to make the cuts long-term, but at this time he is unable to propose a permanent cut." The New York Times, on the bill's "math problem." And the Wall Street Journal reports on how different Americans would be affected by the plan. The president yesterday, via Ali Vitali and Jane Timm: "President Donald Trump said Wednesday he would "certainly consider" sending the man suspected of mowing down eight people and injuring others with a rented truck in New York City to the U.S. detention facility at Guantánamo Bay, Cuba. "Send him to Gitmo — I would certainly consider that, yes," the president told reporters ahead of a Cabinet meeting at the White House... Late Thursday, Trump tweeted that he supported capital punishment in the case." And the New York Times: "With a Twitter message just before midnight, President Trump introduced a surprise complication that may come to haunt prosecutors in a trial against the suspect charged with mowing down passers-by in New York’s deadliest terrorist attack since the World Trade Center was destroyed... Presidents are typically advised never to publicly weigh in on pending criminal cases. Such comments can be used by defense attorneys to argue that their clients cannot get a fair trial — especially when the head of the executive branch that will prosecute a case advocates the ultimate punishment before a judge has heard a single shred of evidence at trial." NBC's Kristen Welker confirms that President Trump is expected to nominate Jerome Powell as the next Fed Chair. Open enrollment for Obamacare has begun, and it looks like a bumpy road, reports the Washington Post. NBC's Ben Popken: "More than 150 million Americans were exposed to Russia-linked propaganda on Facebook and Instagram, the social networking giant admitted on Capitol Hill Wednesday, in a second day of testimony that saw Google, Twitter, and Facebook explaining their role in election interference. That new number, revised from the social network's original estimate of 10 million — and later updated to a whopping 126 million — included Instagram posts, explained Colin Stretch, general counsel for Facebook." The AP, on the president's opioid commission: "President Donald Trump's commission on the opioid crisis called Wednesday for more drug courts, more training for doctors and penalties for insurers that dodge covering addiction treatment. The panel's final report stopped short, however, of calling for new dollars to address the worst drug crisis in U.S. history. Instead, the commission asked Congress for "sufficient funds" and suggested giving the White House drug czar's office the ability to review federal spending on the problem." In apiece for POLITICO, Donna Brazile gives a damning assessment of how Hillary Clinton "took over" the DNC -- and of Debbie Wasserman Schultz's managerial abilities. "The U.S. Department of Agriculture’s chief scientist nominee, Sam Clovis, who now serves as the agency’s senior White House adviser, confirmed in an Oct. 17letter obtained by The Washington Post that he has no academic credentials in either science or agriculture. But the former Iowa talk radio host and political science professor contended in the letter to the Senate Agriculture, Nutrition and Forestry Committee’s top Democrat, Debbie Stabenow (Mich.), that his time teaching and running for political office in the Hawkeye State steeped him in the field of agriculture." Asian countries are bracing for Trump's visit. And the AP profiles Rick Gates. Pro-Trump superPAC America First Action is launching a huge spending blitz. NPR looks at how governors' races are putting immigration on the ballot. AL-SEN: Newt Gingrich is backing Roy Moore. AZ-SEN: Rand Paul endorsedKelli Ward. FL-GOV: The mayor of Miami Beach is the latest to toss his hat in the ring for governor. VA-GOV: And now this, from the Richmond Times-Dispatch: "Democratic gubernatorial nominee Ralph Northam said Wednesday that he would sign a bill to ban so-called sanctuary cities if a Virginia locality tries to become one in the future." Reuters: Trump, who lost Virginia last year by 5 points to Democrat Hillary Clinton, did best in rural areas such as the counties along Virginia’s mountainous spine, less so in urban areas. That tension has Gillespie looking to thread the thinnest of needles, trying to appeal to voters turned off by Trump while retaining enough of Trump’s passionate base to secure victory. Should he win, Gillespie might provide a blueprint for other Republican candidates unsure how to campaign in an era when the president is popular with fewer than 40 percent of Americans."